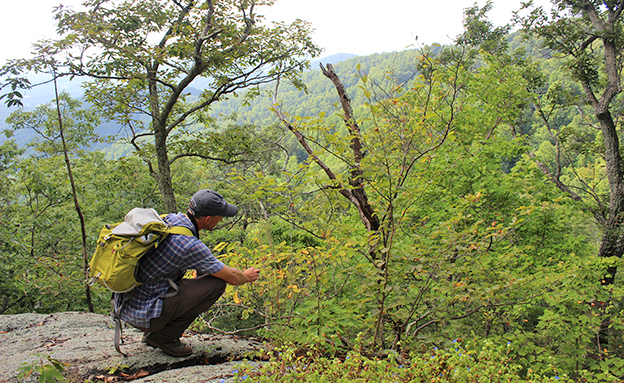 TNC Land Steward Sam Truslow at Fortune’s Cove Preserve, Virginia. I’m no master naturalist, but I’m feeling pretty good about my powers of observation. One of these leaves is not like the others. A lime-green caterpillar about the size of my thumb clings to the underside of a slender branch, head raised to mimic the curl of surrounding foliage. 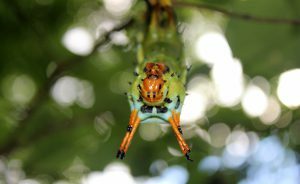 Sides lined with yellow dots and back bristling with silky hairs, the caterpillar will soon transform into one of North America’s largest, showiest moths. Yellow to greenish, with brown to nearly purple patches and speckles, the imperial moth boasts a wingspan of up to seven inches. In focusing on the caterpillar, though, I’ve overlooked one of the most significant details in the story of this forest. 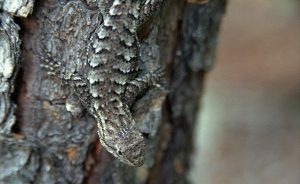 “He’s sitting on a chestnut tree,” says Sam Truslow, pointing out the leaves’ sawtooth edges to my chagrin. On this summer morning, Truslow and I are hiking the Upper Loop (or Yellow Trail) at Fortune’s Cove Preserve, a 755-acre natural area near Lovingston in Nelson County that The Nature Conservancy (TNC) opened to the public in 2002. As TNC’s Virginia land steward, Truslow oversees the care and maintenance of preserves across the commonwealth. 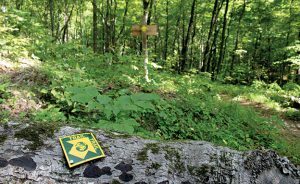 Here at Fortune’s Cove, in addition to maintaining public access and trails, Truslow coordinates with the American Chestnut Foundation to manage an experimental grove far below us on the cove floor, where our trip began. Over millions of years until barely more than a century ago, American chestnuts evolved to dominate the canopies of our eastern United States forests. Massive, straight-grained and rot-resistant, chestnut trees provided lumber for everything from farm fences to flooring to furniture, while the nuts fed wildlife, livestock, and the people of a growing nation. At the turn of the 20th century, heaping railroad cars rolled into American cities from early November through December to meet the holiday demand for chestnuts. Around that time, a fungus was introduced—likely from imported Chinese chestnut trees—and, within a few decades, chestnut blight had decimated the most dominant tree in the East. 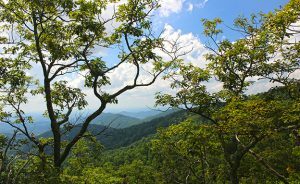 The ecological consequences, especially here in the Appalachians, can scarcely even be imagined today. The majestic chestnuts that graced our mountains remain as difficult to envision as the vast savannas of longleaf pine that once spread along our Southern coasts. But whereas reintroduced longleaf can thrive and grow to maturity, chestnuts today rarely rise above understory shrubs, or survive the blight long enough to bear fruit. Down in the chestnut grove, a fenced one-acre enclosure keeps browsing deer away from a handful of nut-bearing trees. These are the most blight-resistant specimens remaining from a 2010 planting of seedlings produced by varied back-crossings of American and Chinese chestnuts. In spring, these mature trees produce white fringe-like catkins. A prickly green tennis-ball-sized bur protects the budding fruit through summer, and ripe chestnuts drop to the ground in early fall. Nuts collected in fall 2018 will be used to propagate new strains of hybrid seedlings for future plantings. Hickory horned devil (regal moth caterpillar) at Fortune’s Cove Preserve, Virginia. Trail junction at Fortune’s Cove Preserve, Virginia. While the history and potential future of American chestnut capture my imagination, this subplot is only one of many written across this natural area. Fortune’s Cove nestles within a largely intact forested landscape encompassing nearly 30,000 acres, much of which can be seen from rocky outcrops along the ridgetops. Tucked away mere minutes from the steady traffic of Route 29, the preserve sits at the intersection of the Piedmont and the Blue Ridge. These factors combine to make Fortune’s Cove hospitable to a remarkable diversity of plants, songbirds, and other wildlife, as well as to hikers seeking a physical challenge and exceptional scenery. One thing you will not find here: crowds of people. On previous weekend excursions, I’ve arrived to find, at most, two to three other cars in the parking lot. Typically, hikers begin by walking east from the parking area off Fortune’s Cove Lane and following a series of switchbacks up the ridge. Shortly after reaching the ridgetop, the trail forks at the 0.8-mile mark. Continuing along the Upper Loop makes for an arduous 5.1-mile counter-clockwise trek around the horseshoe-shaped cove. 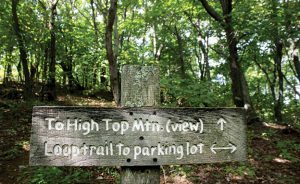 Veering left onto the Lower Loop (or White Trail), however, shortens the total distance to 3.7 miles and lowers the intensity by cutting out the steepest climbs. But since Truslow and I started out from the chestnut grove deep in the valley, we use an unpaved service road to intersect with the trail on the west side of the cove, just below where the two loops re-converge. An enormous white oak shades the trail at the point where we begin hiking clockwise against the usual traffic flow—if there were any traffic. We seem to have the place all to ourselves on this mid-week morning, until a pair of white-tailed deer leap from the trailside brush. The two does lope ahead 50 yards or so at a time as we ascend toward the summit of High Top, the preserve’s highest point. High Top offers stunning winter vistas, but a profusion of summer foliage and undergrowth confines our view to a dome of blue sky and a county communications tower perched on the peak. As we retrace the short spur leading back to the main trail, Truslow pauses briefly to admire the rust-colored flowering spikes adorning a sumac tree. Of course, spring is prime time to enjoy the greatest diversity of flowering trees and wildflowers at Fortune’s Cove. Truslow cites an abundance of white fringetree (often called “old man’s beard”) as a star attraction. “It’s kind of a nondescript tree until that handful of weeks in the spring when it flowers, and then they really pop out of the forest,” he says. Truslow recommends the Lower Loop as the best place to find these billowing white blooms. Springtime displays here also include flowering mountain laurel, rhododendron, dogwood, and wild azalea. 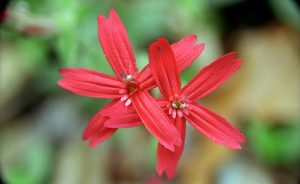 On the ground, look for more delicate wildflowers such as fire pink, which boasts the ruby-throated hummingbird as its primary pollinator. Summer is no slouch of a season, either. 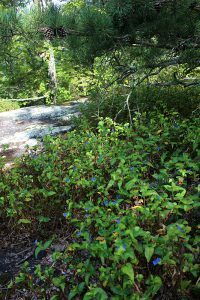 Perhaps a quarter-mile beyond High Top, we take a water break at a small rocky clearing, roughly half of which is carpeted with dayflowers. Blooms hover over emerald-green, ground-covering foliage, like tiny periwinkle-hued butterflies. At eye level, an opening in the foliage affords views of The Priest Wilderness in the distance. Nearby, Truslow points out a stone foundation, all that remains of a former camp cabin. “The Woods family built it in the early 1900s, and they used it as a retreat to play cards and things like that,” says Truslow. As we follow the preserve’s undulating eastern ridgeline, a series of rocky glades affords us clear views of picture-book farm scenery down in the cove’s heart, as well as seemingly endless blue mountain ridges. When the late Jane Heyward first approached The Nature Conservancy about donating Fortune’s Cove and creating public access, it was these glades that most excited TNC’s conservation scientists—but not because of the views, however breathtaking they can be. 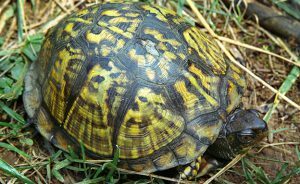 Thanks to surveys conducted by state Natural Heritage Program biologists, TNC discovered an ecological treasure hidden among these rocky outcrops. One of the largest glades is situated at the eastern junction of the upper and lower loops, and we linger here for a while, absorbing the scenery and taking time to observe details—from the varied hues and textures of rock-clinging lichens to dainty yellow wildflowers and little bluestem grass waving in the occasional breeze. Scanning the surrounding trees—Virginia pines and chestnut oaks, mostly—I spot a praying mantis waiting on a dogwood branch for its next meal to wander by. Then, putting a bookend on our hike, I notice a cigar-sized caterpillar dangling overhead. This aptly named hickory horned devil will soon turn into a regal moth, but eyeing its fearsome-looking head, I’d as easily believe I’m staring into the face of a freshly hatched dragon. 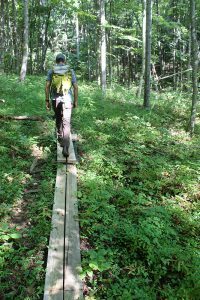 For a trail map and other information about visiting Fortune’s Cove Preserve, go online to nature.org/fortunescove.